The Tumulus of Newgrange, Co. Meath. As the size and character of the grave mounds would depend upon the rank of the dead, the magnitude of these monuments of kings and heroes can be readily understood from the evidence. The Tumulus at Newgrange, in County Meath, lying at a distance of about eight miles from Drogheda, is perhaps the most remarkable monument of its class now existing in any part of western Europe. In one respect, at least, it may compare with any Celtic monument known to exist, inasmuch as a number of the great stones of which its gallery and chambers are composed, exhibit a profusion of ornamental design, consisting of spiral, lozenge, and zigzag work, such as is usually found upon the ornaments, weapons, fictilia, and other remains of prehistoric times in Ireland. The earliest account of the tumulus is contained in a letter written by Edward Lhwyd, keeper of the Ashmolean Museum, Oxford, and dated December 15th 1699. The entrance to the chamber had been discovered a short time before by workmen employed in the removal of stones for the repair of a road. It is recorded, however, in the Annals of the Four Masters that Newgrange was plundered by the Danes in 861. This vast cairn which, even in its present condition, measures from the floor of the inside chamber to the summit 44 feet, and in its greatest diameter 280 feet presents, from a little distance, the appearance of a grassy hill partially wooded; but upon examination the coating of earth is found to be altogether superficial, and the stones, of which the hill is entirely composed, can easily be laid bare. The quantity of stones has been estimated at 100,000 tons. The base is surrounded by a belt of large blocks of stones eight to ten feet in length, upon which a dry wall five to six feet in height has been raised. The like method was adopted in some of the great barrows in England, as in Uley, in Gloucestershire. A circle of large stones, of which twelve may be identified, originally surrounded its base, and when Lhwyd saw it, there was 'another lesser standing on the top.' This pillar-stone no longer exists. The stones stand about thirty feet apart, and if the circle were completed the original number of stones would be 32. The area of the mound is about one acre in extent; but if the area of the circle within the stones be taken, it would extend to two acres. The entrance to the gallery is to the south, and across it lies one of the retaining stones, which is beautifully covered with spirals and lozenges; two others, also richly carved, have been discovered in the boundary circle to the north-west. The gallery, which extends in a direction nearly north and south, communicates with a chamber or cave nearly in the centre of the mound. This gallery, which measures in length 63 feet, is, at its entrance from the exterior, 4 feet 9 inches high; in breadth at the top, 3 feet 2 inches; and at the base, 3 feet 5 inches. The ground-plan of the chamber is cruciform, the head and arms of the cross being formed by three recesses, one placed directly fronting the entrance, the others east and west, and each containing a basin of granite. The lower portions of the walls of the chamber are composed of large uncemented stones, placed in an upright position, over which are others laid horizontally, each course projecting slightly beyond that upon which it rests, and so on, until the sides so closely approximate that a single flag suffices to close in and complete the roof. The chamber is 19.5 feet high, and measures from the end of the gallery to the back of the north recess 26 feet; from the back of the east recess to the back of the west, 21 feet. The recesses are not of uniform size. The east is 7 feet 9 inches in depth, the north 7.5 feet, and the west 3 feet 4 inches. The sides of these recesses are composed of immense blocks of stones; several of the stones in the recesses and passage bear a great variety of carving, supposed by some to be symbolical. The carvings represent various characteristic selections in the work upon the roof of the east recess, in the construction and decoration of which a great degree of care appears to have been exercised. A carving upon a stone forming the north external angle of the west recess is supposed to be an inscription; but even could any satisfactory explanation of it be given, its authenticity is doubtful, as it has been supposed to have been forged by one of the many dishonest Irish antiquaries of the eighteenth century. The same stone, upon its east face, exhibits what appears to have been intended as a representation of a fern or yew-branch. An ornament of a similar character was found within a tomb at Locmariaker, in Brittany. It is a remarkable fact that the majority of these carvings must have been executed before the stones upon which they appear had been placed in their present positions. Of this there is abundant evidence in the east recess, where we find the lines continued over portions of the stones which it would be impossible now to reach with an instrument, and which form the sides of mere interstices. Of the basins contained in the various recesses, that in the chamber, and which stood within the larger basin in the east recess, is the most remarkable. It measures 4 feet by 3 feet 6 inches, and is formed of a block of granite, that must have been brought from the nearest granite district, either Down or Wicklow, a distance of over 50 miles. Two small circular cavities have been cut within its interior — a peculiarity not found in either of the others, which are of much ruder construction, and very shallow. We see in Newgrange a great advance in the architecture of sepulchres from the rude cromlechs of the Stone Age to the well-developed vaulted chamber, with its recesses, of the Bronze Period. But the principle of the rude passage-graves is maintained; and the desire to honour the dead under the most appropriate monument that art and skill could raise remains the same. Within the chamber and recesses the relics of the dead were most probably placed on the basins — a purpose for which these were apparently adapted. 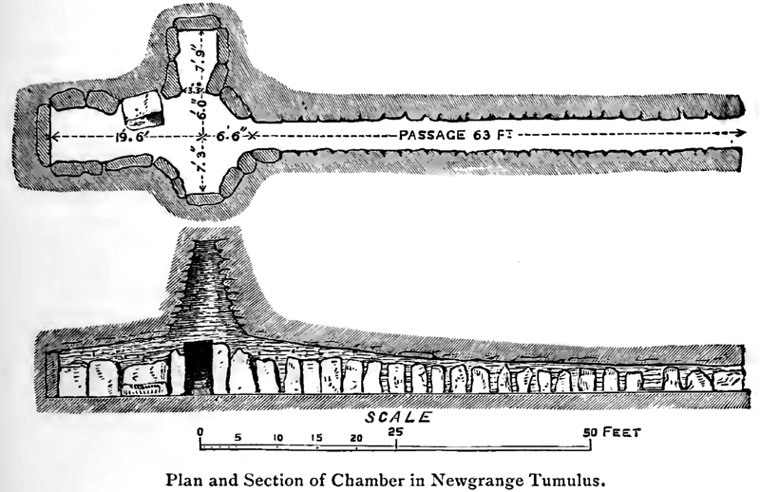 The general plan of Newgrange is similar to the bee-hive tomb at Mycenae, known as the Treasury of Atreus, but differing in size, detail, and general magnificence. This great tomb consists of a long passage, a large vaulted chamber — formed of successive courses of stones laid horizontally and closed with a single slab — and a square recess. In the centre of the rocky floor of the recess is a circular depression 3 feet in diameter and 2 feet deep. Dr. Schuchhardt is of opinion that this was the actual grave, that the recess was never opened but to admit another body, while the great vault was devoted to the cult of the dead. 'It was and remained easily accessible; the rich facade and the expensively-built approach conclusively show that the entrance to the vault was not blocked up after the reception of the bodies.' Other authorities consider that this was not the case, but that the central chamber was the tomb for the family, and the side chamber for specially distinguished persons and chiefs. Whichever view we accept, it is at least suggestive of the purpose for which the Newgrange type of sepulchre was planned. In the neighbourhood of the Newgrange tumulus are two other monuments of the same class, and of an extent nearly equal, the 'Hills' of Dowth and Knowth; or, as they are called by the Irish, Dubhath and Cnoabh, the latter lying about one mile to the westward of Newgrange, and the former at a similar distance in the opposite direction. Among the objects found about the tumuli Lhwyd mentions a gold coin of Valentinian, said to have been discovered on the top of Newgrange Molyneux mentions a similar coin, and one of Theodosius, as being found outside the cairn. A gold chain, two finger rings, and two gold torcs were found in 1842 close to the entrance of Newgrange; and on further search a denarius of Geta and two small brass, but defaced, coins were also found. Too much caution cannot be used in considering these as evidence in determining the date of the tumuli. A bronze pin, a ring pin, and a small iron weapon were found in the chamber discovered in Dowth in 1885. If, as seems certain, this chamber and passage are of much later date than the tumulus itself, the presence of these objects is easily accounted for. 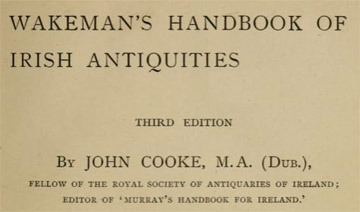 A discussion of the evidence upon which expert opinion is based, as to the date of these monuments, is outside the province of this book. It takes into consideration the character of the architecture, the nature of the ornamentation, and the objects found. Weighing these, the Boyne tumuli are assigned to the Early Bronze Period, and Newgrange is considered the oldest of the group.